April Fool’s Epic Ride at China Camp State Park, third year running. 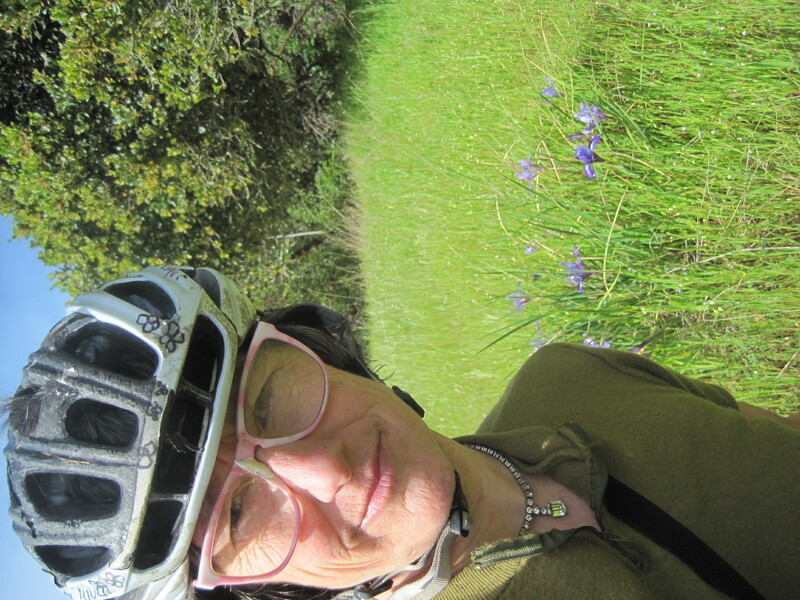 I often hear that the riding’s great from my friends who live in the Santa Venetia area of San Rafael, east of Highway 101. This peninsula was very quiet, sparsely populated until the post-war boom in cheap little homes. The subdivision owners and county planners neglected safe routes for pedestrians, and kids. When the graders came in and widened the freeway, any access between points south for non-motorized Marinites was effectively cut off. A large public tract, China Camp State Park sits perched overlooking the northern reach of S. F. bay, where generations of Chinese lived and fished until (big gap in my historical awareness of why Chinese left–wild guess: their subsistence lifestyle was declared illegal), well anyway the name remains, and even some of the original buildings clustered on the edge of the water. The big draw here is the wide open public lands, not the history. The terrain was barely rideable uphill, and terrifying down the other side. I had a pre-race nightmare about the sketchy ball-bearing surface (it being mid-summer). I kept accelerating, with my rear wheel locked up (in those days my front-brakesmanship was imperfect, so different now). I fishtailed. The bike kept going faster, shimmying me off into the vicious tangle of manzanita. I promised myself I’d get off and walk the 18% grade descent. I won the race easily, never had to push my bike up the hill, but I got my first taste of heckling from the sidelines on the descent. My chief competition was liberally bloodied, and noisily cheered. Vertical fire roads didn’t make for a truly fun ride, but there was a nice flat shoreline path for hikers…. The tract is huge and this state parkland was the first that welcomed off-road cyclists (thnx to the initiative of ranger Patrick Robards). These days it is very popular (with both cyclists and hikers) despite the dire warnings of the HOHAs (hateful ol’ hikers association) that the two must never mix. Last Saturday I learned a bunch of new ones. The April Fools Ride Epic covered roughly 50-60 miles and a staggering 10,000 feet of climbing in a single spring day…. Here are some pictures. I rode with a handful of new friends from as far away as Colorado, and as near as Truckee… The flowers were insane. The place where we celebrated ( I’ll call it Luck’s Banding) was the quaintest, quietest little spot you could ever imagine. Joey served up grilled sausage, Karen brought potato salad, we bought beer by the bottle (no tap at Luck’s Banding) and felt the salt dry all over our beaten up bodies as the wind picked up after sundown. ~ by jacquiephelan on April 5, 2011.